Looking Back at This Date in American History…June 17, 1775…Peter Salem…Thinking about Black men and women soldiers today on the brink of returning to the Middle East. Our history clearly informs us that Black patriots have fought in every skirmish and war in defense of our colonies and America. All soldiers were honorable patriots who risked their lives for national security past, present and future.and to improve the “quality of life” for their own future generations to be included and treated by our nation like honorable descendants of patriots free of racism and pre-historic and unnatural contempt. At dawn on June 17, 1775, British Gen. William Howe ordered fire on American forces three times and drove them northward across Bunker Hill. In this battle, the Americans had 400 dead and wounded men; the British lost more than 1,000. 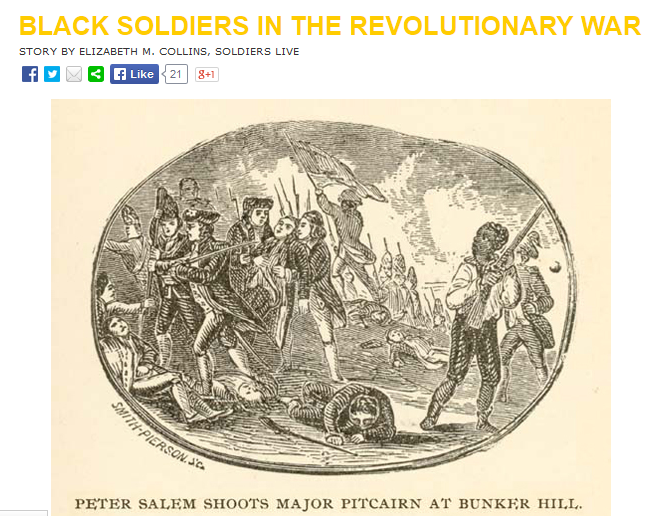 Freed slave Peter Salem was credited with the shot that killed British Maj. John Pitcairn. It’s the winter of 1777-1778. Under Gen. George Washington, the Continental Army is waiting out the winter at Valley Forge, Penn. Just one year earlier, they had led lighting-fast, surprise attacks against the British at Trenton and Princeton, N.J. But now, many of the Soldiers are without shoes and blankets. They’re starving. They’re suffering from exposure, typhus, dysentery and pneumonia. They’re dying and they’re deserting and Washington has no way to replace them. States aren’t meeting their militia quotas.